The Arkhangelsk Region, which is rich in timber, intends to attract investors from China and Sweden to its wood processing industry. At the Sochi Investment forum, governor Igor Orlov told RBTH which foreign companies are already working in the Arkhangelsk Region and what new products the province is ready to export. 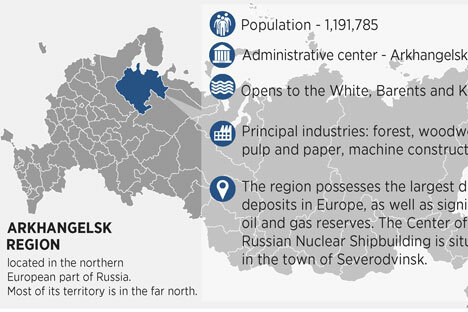 The Arkhangelsk Region is known as the heart of shipbuilding, Russia's main "sawmill" and the region that houses the country's only cosmodrome. Foreign investors' main interest in our region is timber. The U.S. company International Paper has been operating in the region since 2007. It is a joint venture, the Ilim Group, which includes a pulp and paper plant in the Arkhangelsk Region. Over two and a bit years, the Americans have invested nearly $1 billion in upgrading the enterprise. Interest in the timber industry, in wood processing and the manufacturing of wood products, has been expressed by Swedish and Chinese investors. We do not consider the current state of affairs as outstanding: Of course, there should be more investors, there should be new technologies, but investment is coming to the region, there is no doubt about that. For our part, we are interested in attracting both foreign and Russian businesses into housing construction. We need new technologies. The region's construction sector is in a difficult situation. We are doing a lot to switch to biofuel and have a whole series of projects to that end, worth several billions of rubles. The main type of biofuel that we produce is pellets. I envisage that over the next 12-18 months we will become the country's biggest manufacturer of wood pellets. It is a modern and very efficient biofuel, which is extremely promising from the environmental point of view and is in great demand in Europe. It is also a promising export product. In certain aspects, those to do with financing, businesses may have encountered some difficulties in operations, but these have not been critical. Some operations are taking longer to complete or have become less convenient, but they are carried out anyway. Goods are being dispatched, so the difficulties are quite manageable.